Above: The ruins of Jemez Historic Site nestle near a spectacular mesa. Photographs by Minesh Bacrania. THE MURAL ON THE faded exterior of the Los Ojos Saloon, an old mercantile built in 1947 in Jemez Springs, displays a handful of dusty cowboys drinking hooch. Inside, taxidermy—rams, deer, elk, sheep—and old rifles cover the walls. The barstools are 50-year-old hunks from the cottonwoods that thrive in this lush, narrow valley. At a low wooden table, a man named Roger Sweet, an artist with a headful of curly, gray, shoulder-length hair, tells tales and wonders how the area is changing. “This place is like going into a dream state,” he says. It’s hard to tell if he’s referring to the bar or the town, which is enshrouded in thick, low-hanging, moody clouds. A light rain falls outside. The proprietor stops by the table. Olga Appell is a broad-shouldered, affable woman and a former long-distance runner and two-time Olympian, first for her native Mexico and then for the United States. She moved to New Mexico to train at elevation, met a guy, and never left. Sweet has a similar story about filming Native dances with anthropologists in the 1970s and falling in love. He’s the mayor now. Nearly 300 people live here, and every last one of them seems to have a love story. Most center on the power of the community or the pure natural beauty of this place. Located about 65 miles from both Albuquerque and Santa Fe, deep in the Jemez Mountains in San Diego Canyon, at the foot of two stunning mesas—named Virgin Mary and Cat—Jemez Springs is ideal for a weekend (or lifetime) getaway, with solitude, hot springs, rich history, trails for hiking or cross-country skiing, art galleries, and a new brewery. None of those things are why people have lived here for thousands of years. Long before logging, mining, or tourism, Jemez Springs, then called Giusewa, was comparatively cosmopolitan. Its heyday came about 500 years ago, when 30,000 Jemez Puebloans lived in some 40 villages atop the mesas, where they dry-farmed corn and other crops and lived in massive four-story stone townhouses. That pueblo, now in ruins, can be visited at the Jemez Historic Site, at the north end of town, where a new exhibit and museum will debut this spring. Wars with the Spanish and diseases that came with contact reduced the population of Giusewa by at least 75 percent, and possibly by as much as 99 percent. Today, Jemez Pueblo lies 12 miles downvalley, toward Albuquerque, where junipers and piñons cover bright red rocks. The Walatowa Visitor Center has educational programs and classes, as well as guides who lead tours of the trails that wind through the vibrant mesas. (“Walatowa,” which means “this is the place,” is what the Jemez people call the pueblo in their Towa language.) Head the other direction on NM 4, toward Los Alamos, for more trails, connections to Ancestral Puebloans, and stunning scenery at the Valles Caldera National Preserve, the site of a volcanic eruption 1.25 million years ago that formed some of the features of San Diego Canyon. The preserve doesn’t have a great trail system, but it’s worth a visit for the views of the 13-mile-wide meadow known as the Valle Grande. 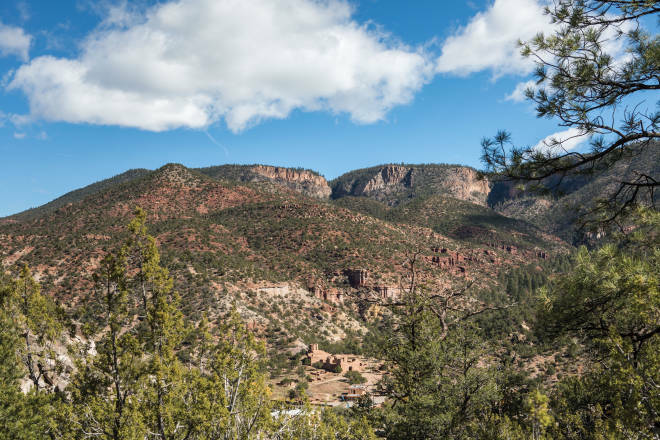 For hiking, check out Las Conchas Trail, a flat amble along the East Fork of the Jemez River that weaves through a narrow valley frequented by climbers, or Battleship Rock, a striking cliff that has trails to McCauley Warm Springs and Jemez Falls. 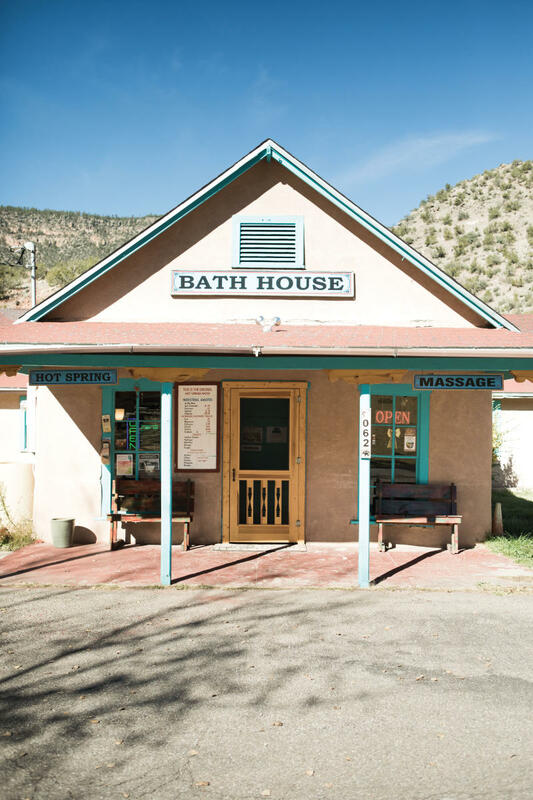 Above: Spa lovers have relaxed at the Jemez Springs Bath House since the 1870s. Back in Jemez Springs, I stayed at Sweet’s place, in an old pump house in the middle of town. It’s a cozy little cottage along the river, with old cottonwoods, a lush garden, and a deep acequia. He has two rental units on the property, which is called Casa Blanca Jemez. Another mile down the valley, Cañon del Rio has six cute rooms, a hot tub and pool, massages, and incredible breakfasts. Both places are reasonably priced. Most people come here for the rich minerals in the water. Jemez Hot Springs, “Home of the Giggling Springs,” has four pools of varying temperatures. It’s clean and well maintained, with hammocks and little cabanas and a limit of 25 people at a time, so it never gets too crowded or noisy. The Jemez Springs Bath House, located in a historic building from the 1870s, has private tubs that tap right into the adjacent spring. Mineral deposits have to be chipped off the plumbing from time to time. The most striking example of what those deposits can do is nearby Soda Dam, a natural wonder, and a pretty good swimming hole, formed by travertine deposits. All the walking and water will make a person hungry. The town’s few restaurants reinforce the sense of community. Locals convene at Highway 4 Coffee for delicious homemade samosas. The eclectic Jemez Stage Stop gets its eggs from the chickens living next to the restaurant, and the huevos rancheros are delicious—and the service is earnest. “Conservatives and liberals, hippies and cowboys, we all get along here,” says the waitress when she brings us samples of green chile stew. The saloon is as fine a watering hole as any, and it serves a tasty burger, too. A new brewery recently opened in the old firehouse, where one of the owners, Jess Lewis, was a junior volunteer firefighter while his dad was chief. Lewis went on to become the deputy fire chief for the Sandoval County Fire Department, and now he’s back at what has been reborn as Second Alarm Brewhouse. It serves food adopted from Monica’s Snack Shack, a popular local food truck, and a couple of its own beers, along with other New Mexican labels. It doubled the number of places for folks to gather over a beer in this town. The Jemez Mountain Trail Sale, in October, is a 26-mile-long yard sale from San Ysidro through Jemez Springs on NM 4. Jemez Pueblo hosts its Nuestra Señora de Los Ángeles Feast Day in early August and the San Diego Feast Day in mid-November. Both are open to the public. Each December, more than 1,400 farolitos line the Jemez Historic Site during its Light Among the Ruins event. Consider A Mini Road Trip: Starting in Albuquerque, head to Jemez Springs via US 550 and NM 4, looping past the Valles Caldera and on to Los Alamos, Santa Fe, and back to the Duke City on I-25.